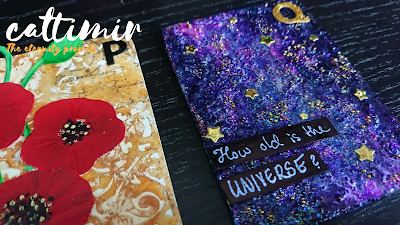 Here are my latest cards for the 52 Cafe cards challenge. I'm not sure if the alphabets U and V are published. The mojo seems to have left the building. The last two cards are looking simple and unfinished. The first one looks nice but I had trouble with that one, too. 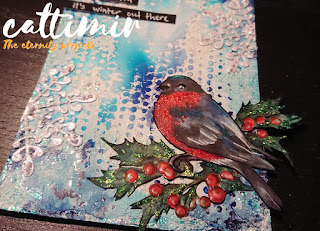 I have been into card making the last few months so mixed media type projects have felt too demanding. I have had no interest in getting messy and pretend to be an artist. I have even started to think that I would reduce my art supply stash. Why would I need many bottles of acrylic paints, sprays or waxes if I only use them like once or twice a year. Same thing with stamps and stencils... I have lost the vision and inspiration for mixed media. I know this is just a phase and they will come back. I made Spring cards more than I had planned to make. Well, these first six cards I sent to the cancer association of Satakunta in Pori. Like the Christmas cards they will be handed out to strangers. I hope the recipients will like them. I'm not entirely satisfied with all of them but I do like them. I had ordered quite a few new diecutting sets. They are all by Marianne Design. The Oval shape set I had bought second hand but all the rest are new. 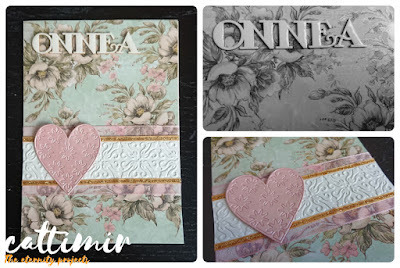 The embossing folder is the Regal checkerboard by Creative expressions. I tried to use up my cardstock and scrapbook paper stashes but obviously I could never find the right shade I needed so I was forced to get some new ones. I used Distress inks to give some shading to the flowers and the greens. This is my current big crochet project. I had the white weft stored for such a long time that I had to unravel it into skeins to have it washed in the washing machine and then roll it back into balls. I got some exercise while doing that. The linen brown cotton yarn is also very old. They are the same yarn but from different batches. The labels tell more than the actual color shade. Novita doesn't manufacture this yarn anymore although there might be a replacement for it. But it doesn't matter, I have plenty of these yarn balls tucked away. I bought a big bunch of them and have been saving them since then. These 52 Cafe cards are from the letter I to the letter N, but just today the letters O and P were announced. I have some pre-made backgrounds I could use for those. I just need to figure out how to make them correspond to the themes "Oval" and "Poppies". In general the supply list is something like this: white gesso (different brands), Galeria's gel medium with beads, Lindy's shakers and sprays, Ranger's and 13arts' acrylic paints, micro beads and diecuts, glitter glue and markers. Pretty much everything I would use at some point, not all in one work. The inspiration for these cards was mostly lost. I couldn't get a good grip of it. So, some of these cards look unfinished. I'm talking about the "Kindness", "Lilac" and "Navy" to be exact. They were such a waste of supplies. I couldn't get them finished no matter how much I repeated adding colors and texture. So eventually I just had stop working on them. The Valentine's Day is soon here. Above is a card I made for my niece. It's both the Valentine's Day card and the 25th birthday card. And actually the design could also pass as an engagement or wedding card. This was quite quick to make. It had to be. I should've made it during the weekend but somehow forgot to check the calendar. The niece's birthday is much sooner than the Valentine's Day.